This workshop held on 16th March was well attended by 10 members, the newest member being Sue Blain. Full attendance of both first and second-timers made for a busy morning. Annette had us all under control and provided a light-hearted atmosphere with some more stressed than others. 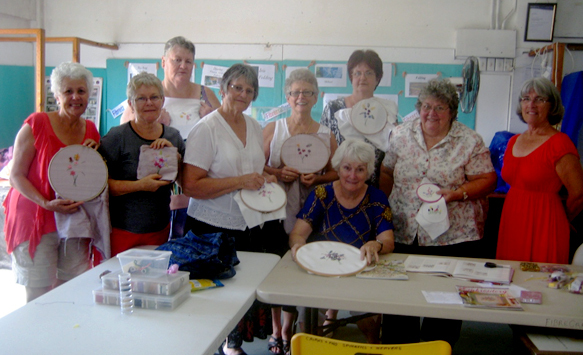 A general happy feeling of satisfaction was eminent however and it became obvious that Annette will be lined-up for another Ribbon-embroidery Workshop next year. So for those who missed out this time, make sure to put your name down as it is well worthwhile.